﻿Permaculture is an ecological design system for sustainability in all aspects of human endeavor. It teaches us how build natural homes, grow our own food, restore diminished landscapes and ecosystems, catch rainwater, build communities and much more. The philosophy behind permaculture is one of working with, rather than against, nature; of thoughtful observation rather than thoughtless action; of looking at systems in all their functions, rather than asking only one yield of them; and allowing systems to demonstrate their own evolutions. 1.Care of the Earth. This includes all living and non-living things. Implicit in this is a "life ethic"... that all living things have intrinsic value. 2. Care of People. Promoting self reliance and community responsibility. 3. Return of Surplus (or Fair Share). To pass on anything surplus to our needs for the aims above. The real difference between a cultivated (designed) ecosystem, and a natural system is that the great majority of species (and biomass) in the cultivated ecology is intended for the use of humans or their livestock. 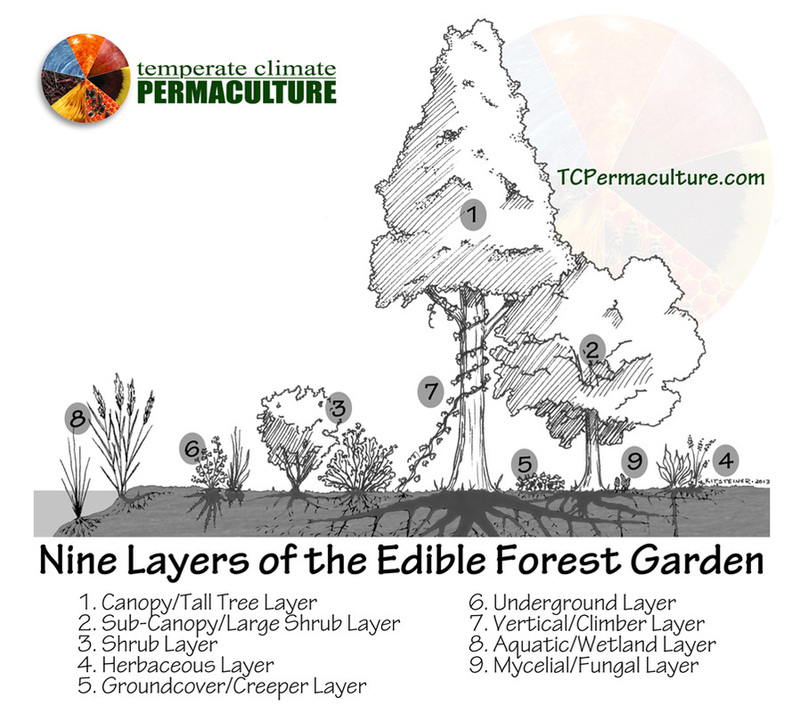 A forest garden, or food forest, "is an edible ecosystem, a consciously designed community of mutually beneficial plants and animals intended for human food production." ~ David Jacke (Edible Forest Gardens Volume 1 p. I) It layered system mimicking a natural forest, but substitutes in many food species. In most references, you will typically see 7 layers to a forest garden. However, I particularly like John Kitsteiner's philosophy on the layers of a forest garden. Here are some short documentaries that demonstrate just how transformative permaculture can be. The Loess Plateau in north-ce﻿ntral China was a devastated landscape. Centuries of overuse and overgrazing led to one of the highest erosion rates in the world and widespread poverty. John D. Liu was able to document the recovery of this and other regions in this short documentary. Hope in a Changing Climate is from 2010. Green Gold is a followup to Hope in a Changing Climate. John Liu visits Jordan, Ethiopia, and Rawanda. Geoff and Nadia Lawton have also had significant success in "Greening the Desert" of Jordan, in the Dead Sea Valley. You can find a bunch of highly informative permaculture videos for free at www.geofflawton.com. You do have to provide your email, but they do not spam you with a ton of emails.